The Navarre Krewe of Jesters is proud to present the 33rd annual Navarre Beach Mardi Gras Parade. Come out for family-friendly fun, floats, and beads! The theme this year is “VooDoo on the Beach”. Click for parade application. 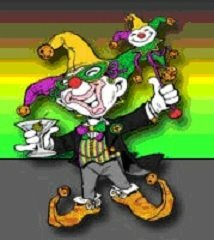 The Navarre Krewe of Jesters was founded in 1986. Throughout the years, the Krewe has grown in membership. The parade, first held February 28, 1987, has grown from 10 or so walking Jesters and a ragtag mix of vehicles and floats to almost 60 floats and entries. This annual event takes place on the Saturday prior to Ash Wednesday. It draws entries from local businesses and social organizations as well as organizations from as far away as central Alabama. The Navarre Beach Mardi Gras Parade is well known as a family oriented parade. Many families are annual spectators, knowing that their children will enjoy a parade free from the bacchanalian escapades that inundate other parades.